For a beginner, the best way to get the benefits of the build-up of carbon dioxide is to try to maintain natural breathing (relaxed abdominal breathing) as much as possible and in as many activities as you can. What I am saying here is that it is good to rest in a healthy posture (sitting, standing or lying) and breath minimally and naturally, and it is also good to exercise hard without forcing yourself to breathe more than you need to. You can experience some undesirable side-effects if you breathe more than your body needs to both while at rest or during exercise. If you are exercising or doing physical activity, then it is normal to increase your breathing. However, if you are breathing naturally, the inhalation should at least begin in the abdomen, then it may also go to the chest. 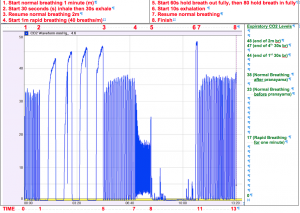 Ideally the exhalation is still passive, although if you are exercising really hard you may need to use extra muscles to breathe out faster (for best health results this intensity of exercise should not practiced more than about 10% of the total exercise time), and you should still not breathe more than you feel you need to during those times. For more advanced practitioners of breath-control exercises there are many things one can do with breathing that can increase carbon dioxide once the body is adequately prepared. 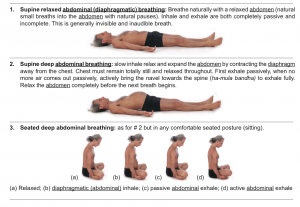 Very slow breathing of up to 30 seconds inhale and 30 seconds exhale, and holding the breath are two of these ways. 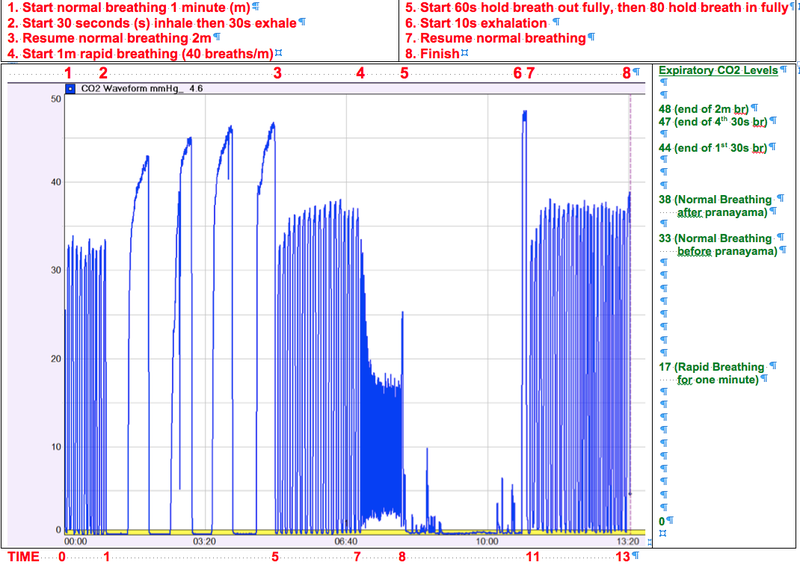 In the graph below showing time on the horizontal axis and levels of exhaled carbon dioxide (CO2) on the vertical axis, you can see how my exhaled carbon dioxide levels (which are generally elevated if you are in good health) increased when I breathed less than normal and decreased when I breathed more than normal: I followed my period of increased breathing by not breathing at all for a few minutes. This left me with the highest level of carbon dioxide during my final period of natural breathing and also left me with increased levels of energy and a very peaceful state of wellbeing. It is best for most people (until they are very experienced) to practice posture and movement separate to specific breath-control. It is difficult for most people to do more than one thing at once while each is still being learnt. What tends to happen when people try to learn posture and breathing at the same time is that either the posture or the breathing is compromised. Compromising the posture can damage muscles, ligaments or joints. Compromising breathing could lead to over-tension, over-stress back problems, headaches, problems with digestion immunity and your reproductive system as well as a host of other problems. 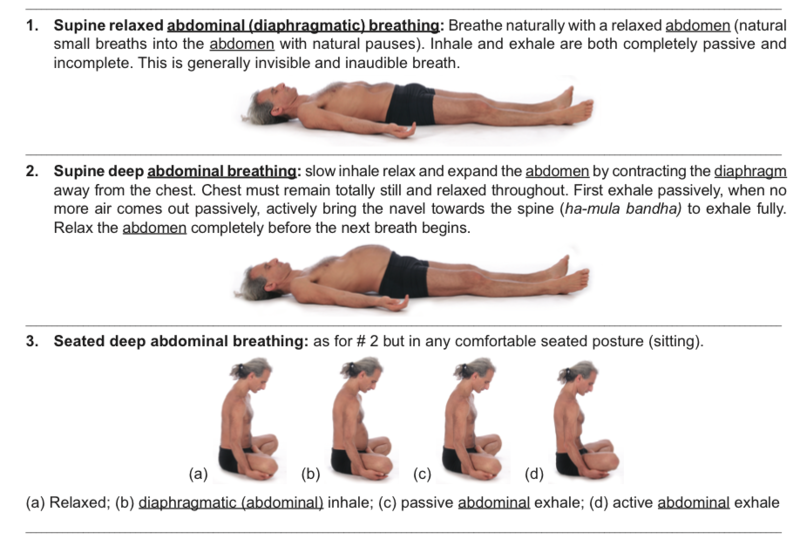 The best way to breathe is Diaphragmatically. This is because the diaphragm is a key controller of the Autonomic (Automatic) Nervous System. The Sympathetic Nervous System – This regulates the Fight or Flight Response. So it prepares the body for anticipated danger or conflict. When stimulated it causes Heart Rate and Blood Pressure Increase. 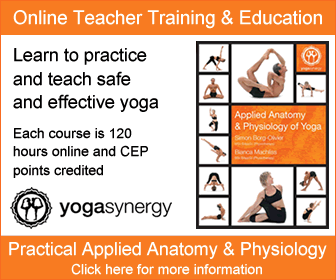 The Parasympathetic Nervous System – This is the Relaxation – Recovery System. When stimulated it causes Heart Rate and Blood Pressure Decrease. When the diaphragm is being used correctly the activities of the autonomic nervous system are more likely to be in balance. Each practice can be done with a passive exhalation (through the elastic recoil of the muscles of breathing) or with the assistance of muscles of breathing. 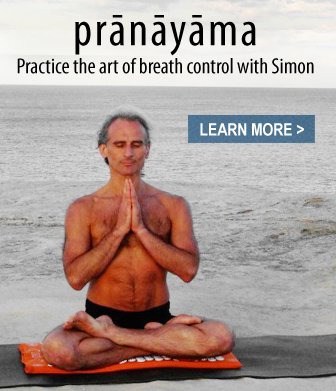 If you wish to learn more about breathing you can join our 17 session online video course on simple breath-control for everyone that can help you to calm you mind, give you lots of energy, help you sleep better and help to relieve and/or prevent back and neck pain. 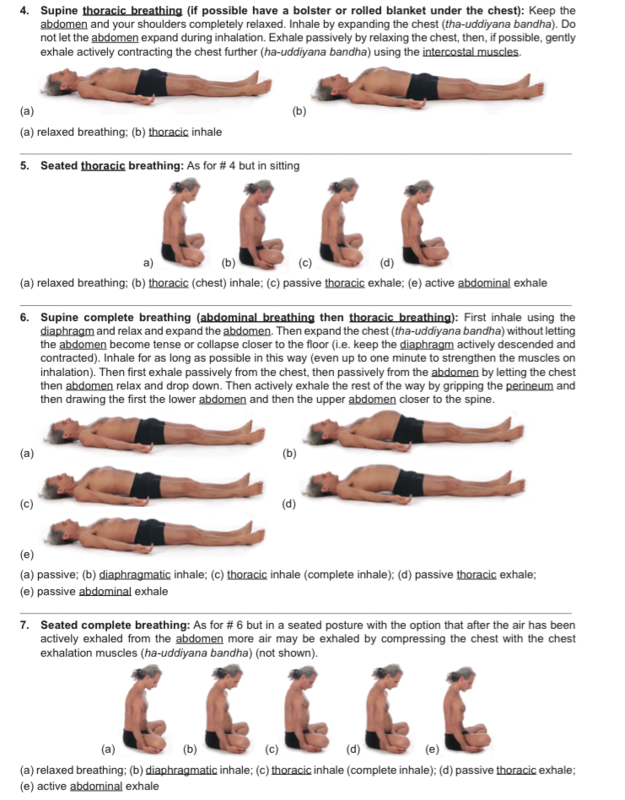 Breathing exercises from Applied Anatomy and Physiology of Yoga” By Simon Borg-Olivier and Bianca Machliss. Please click to enlarge and clarify. Great article!! Very helpful, reaping the benefits already. I unfortunately know of someone who took this to the next level. He inhaled CO2 from a tank thinking that the “increased” level of CO2 would energize him and maximize his strength- it instead killed him. He essentially inhaled so much CO2 that it displaced his O2 level in his blood. Hi Linda – thanks for you comment – very interesting but sad at the same time – wow – how crazy is that – it is so important to very gradually adapt to changes in internal pH or changes in carbon di-oxide levels in the body. To do this the way he did is so dangerous obviously. This is why I teach people how re-establish the natural breathing we had as children. To tamper with your internal physiology is potentially dangerous for sure. And any changes have be done slowly and with the guidance of someone who really knows what they are teaching. There are many people in the world today who are teaching breathing techniques that are potentially very dangerous in the untrained hands – there is no such thing as a wrong exercise in my books but you have to be ready for it and many people in the world today are teaching potentially dangerous breathing of ether hyperventilation or hypoventilation or breath retentions with muscle activations that can radically alter internal pressures, to people who are not ready for them.